At the end of the 19th century horse omnibuses operate on established lines in Sofia City between the Sveta Nedelya Square and the Railway Station, Gorna Banya and Knyazhevo districts. 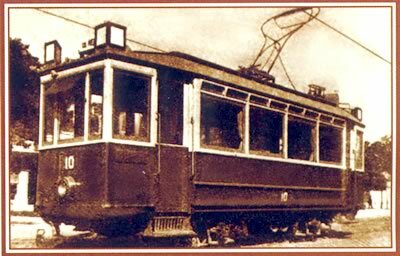 The history of the electric transport dated from 01.12.1898, when the Municipality gave the concession for supplying the city with electricity and building of tram lines from French company “Marsilia” and from anonymous Belgium company “Electric tram”. 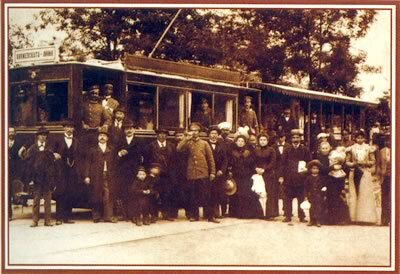 The tram was officially opened in Sofia on January 1, 1901. The lines were operated by 25 trams and 10 trailers. There were 6 tram lines of total length of 23 km single track. The track gauge is 1000 mm. 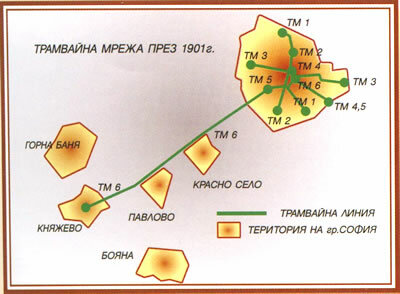 The tram system in the beginning of the 20. century consists of following lines: The Railway station - Lion bridge- Slaveykov square; the Tzarigrad line, the Knyazhevo line , the Poduyane line, the Alabine line etc. The first are small tram coaches and have 2 axles, 2 motors of 18 kW each, open - top platforms surrounded by metal grills. The cabin has first class and second class compartments. The trailers are open - top, the passengers get on and off from the side and the conductor moves on a special step around. With the increase of the passenger traffic in 1908 new type of trams have been delivered: 12 two-axle Siemens coaches and 6 four-axle Zeppelin coaches with two motors of 33 kW each. In 1916 the Sofia Municipality initiated a procedure of seizure of the exploitation of the trams from the Belgium company by forming a Trams and Lighting Directorate, which had two departments: Trams and Lighting. The procedure ended in 1927. Since 1927 the Tram department has been divided into two sections: Movement and Technical Workshop, each one managed by a director. In 1948 the lighting department was separated and the new company called Sofia Public Transport was formed. It organized the tram, trolley and bus transport. In 1927 the Main Technical Workshop was organized and equipped on the territory of Maria Louisa Depot. This 1927 year is accepted as the inauguration year of the Workshop for Repair and Refurbishment of trams and Trailers. During the period between 1924 and 1938 the last imported trams were put into operation. Following types of trams are running at that time: two-axle cars with platforms made in the Ringshoffen Factory in Prague, two-axle trams of Franco-Belgue, equipped with BBC electrical drive, four-axle cars of Atelier Metallugique de Nivelle, equipped with electrical drive of ACEC, trailers "Energy" from Belgium; trams of MAN-Siemens, trailers with a single middle door produced from the factory "Jurdingen und Wegmann", trams produced by the Ernesto Breda Factory in Milan, equipped with electrical drive from Ansaldo Marelli. On the base of the experience gathered from the repair of trams, in 1931 the first Bulgarian trailers were produced in the technical workshop under the management of Eng. Kardalev. In 1935 were built 12 entirely new trailers. In 1934, a new modern and spacious construction was erected in Krasno Selo Depot where the Main Technical Workshop was situated after the World War II. In 1936 the production of the first two-axle trams began. These trams were equipped with imported controllers and motors. In 1951 the technical workshop became a separate factory. 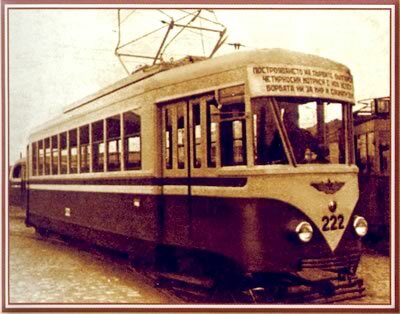 In 1952 the Sofia Public Transport was separated into two companies: Sofia Autotransport and Sofia Electrotransport. In 1956 the repair of the rolling stock was taken by Sofia Electrotransport company. In 1959 both companies merge into the Public Passenger Transport Company. Since 1964 the Electrotransport company has been separated as Branch 1 of the Public Transport company. single tram Sofia (1965), two-articulated tram Sofia-70 (1970); single-articulated tram Sofia-100 (1979); eight-axle, two-articulated car Bulgaria-1300 (1981). During the next years the disadvantages of these models lead to the development of a new type tram with cardan. In 1986 the first car of this type was manufactured. On its base the new T6MD -1000 tram track with track gauge 1435 mm were produced. Since July 1, 1987, the Electrical Transport Company has been separated into several companies: Tram Transport, Trolley Transport, Transenergo, Transremontstroy and Rope-ways. In 1987 the new Iskar Tram Depot is inaugurated for 1435 mm track gauge trams. Then the first line of this track gauge was commissioned. 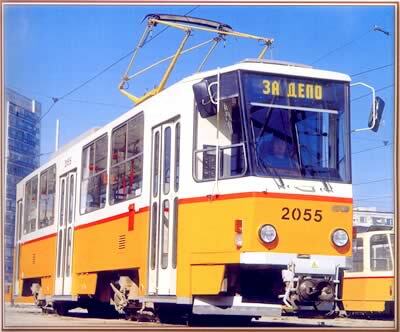 In 1987 37 pieces of the T6B5 trams produced in Czech Republic were imported. During the period 1990-1991 40 cars of the type T6A2 - track gauge 1009 mm - were imported from the Czech Republic. In this year the tram-car of the type T8M-900 was manufactured on the basis of the T6M-700M model. 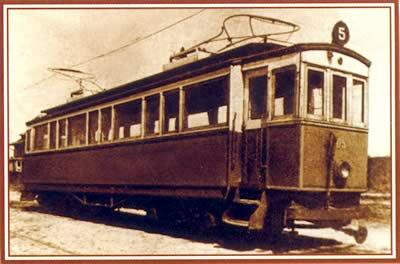 The production of Bulgarian trams was terminated thereafter. In 1995 the new tram line No. 22 is opened from the Iztok district to the Mladezhki theater. German second hand trams (Duwag) were imported for this line 29. In 1998, the updating of the T6M-700M trams began. Since December 1999 the production of the new partially low-floor car T8M-900 has begun. 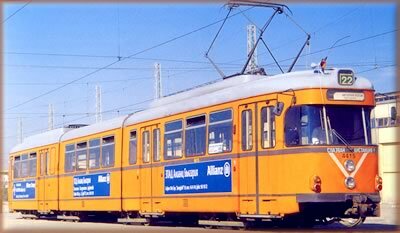 In January 2000 the first two second - hand trams of the T4D type were imported from Germany. 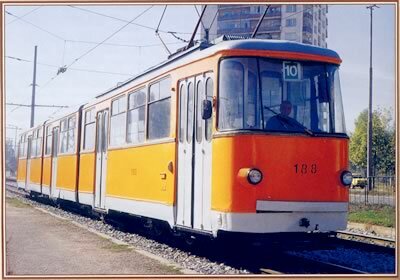 In April 2000 17 Czech cars of the T6A2-BG type were put into operation and in July 2001 16 second - hand trams of the T4D type were imported. Simultaneously with to the increase of the number of trams the line network has been getting lager, as well. The total length of the tram lines in 1944 amounts to 79.3 km single track. During the period of the Second World War the base of the existing tram line network was established. On May 19, 1998, the SKGT Electrotransport EAD was established. Since December 8, 1999, it forms a separate joint-stock company dealing with the management of the tram and trolley transport in Sofia. As of 2002 the tram transport system has been transporting passengers articulated 16 lines with a total length of 221 km of single track railway, and at an average speed of 13.8 km per hour. During the weekdays 190 trams are at work; operated by 380 drivers. As of 2006 the tram transport system has been transporting passengers articulated 17 lines with a total length of 308 km of single track railway, and at an average speed of 12,56 km per hour. During the weekdays 176 trams are at work. 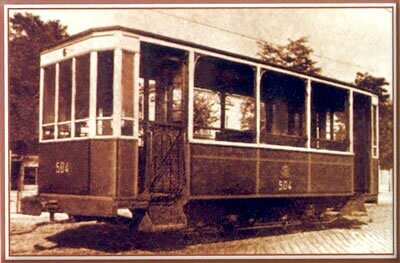 At the early years of the tram transport, until 1925, the power supply was provided by "Pancharevo" hydroelectric power station and a reserve electric power system, driven by steam engines. As a result of the increased power consumption in 1904 and 1906 two motor-generators of 400 kW were supplied and installed by the Charleroi and Oerlicon companies, respectively. In order to maintain a constant voltage of 600V during the peak-consumption hours an accumulator battery system of 972 A/h was delivered and installed by Siemens. After 1920 new modern and more powerful rectifying systems were put into operation - those were mercury rectifying groups, manufactured by AEG (400 kW), Siemens (500 kW), and CKD (600 kW). During 1966 the first silicon rectifier (CKD) was put into operation (1500A/900kW) in the converting substation "Yunak". The electrically driven transport in Sofia is supplied by power, generated by converting substations. Consecutively are built TIS "Pavlovo" TIS "Veslets", TIS "Unak", TIS "Dimitrovska", TIS Meditsinska akademia", TIS "Levski", TIS "Nadezda". From 1970 to 1975 are built and put in operation 5 new silicits converting substations" TIS "Krasna poliana", TIS "Darvenitsa", TIS "Perlovets", TIS "Voenna rampa" and TIS "Vazrazdane". In 1971 is put in operation telecontrol "Vazrazdane" with possibility for remote control of 20 TIS. 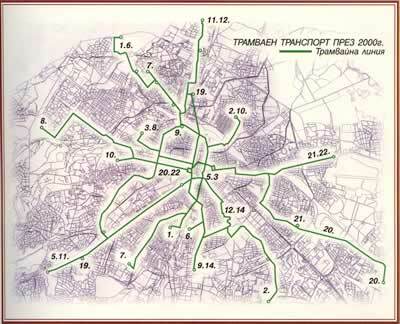 With reference to the fast development of tram transport after 1975, are put in operation new TIS: TIS "motopista", "tIS "Lulin", TIS "Iskar", TIS "Druzba", TIS "Aliende", "TIS "Zapaden park", TIS "Bakarena fabrika", TIS "Banishora", "TIS "Hadzi Dimitar". The increase of the installed electrical power from 1901 until 2000 was from 550 kW to 125.950 kW respectively, and the consumed energy was 500 kWh and 68,500 kWh respectively with the peak consumption of 85,900 kWh in1990. In 2000 an installation of a new remote control system (called Telegyr 805) of the rectifying stations has started. The system was supplied by the Swiss company "Landis-Gir" and it is capable of controlling 40 rectifying stations. At present the electrical power supply of the Sofia public transport is provided by 23 converting substations equipped with 73 rectifying aggregate. Until 1924 the power supply of the trams has been carried out by means of roller slides; later on a new slide system has been implemented. As a conducting material a round copper wire with cross-section of 50 mm2 has been used. In 1927 a new profile has been chosen; it was attached to the insulators by means of special clamps. At present, a wire with a cross-section of 100 mm2 is used. In 1930 new ceramic insulators have been tested and put into operation. In 1931 the suspension points of the wires had a span of 35 - 40 m between them; because of the poor contact, sparking and burning this span now is reduced to 15 - 20 m.
At the end of 1961 the tram catenary system was over 100 km articulated, and the trolley cable network - over 52 km articulated. During the next few years the networks have been reconstructed. At the end of 2001, the total length of the cable networks was 210 km for the tram network, and 274 km for the trolley network. At the end of 2006, the total length of the cable networks was 263 km for the tram network, and 257 km for the trolley network. For the first time in 1930 a new electrical control of the tram entry switch were successfully tested. At the end of 2001 all the entry switches were controlled by the driver from the driver' cabin. In 2000, a new radio remote control has been introduced at the Hemus hotel - the diversion to the Lozenents district. Using the same principle for a first time an automatic trolley switches has been installed at line No5 near the Okrazhna Bolnitsa. Since 1901 until 1961 the power supply voltage has been generated in 7 kV, the local power stations. Starting from 1961 until 1967 a gradual transition to 10 kV power supply has taken place. Each rectifying station is provided with reserve power supply. Initially, oil cables have been used; since 1961 dry cables with a copper string, aluminum string cables, and cables with polyethylene insulation have been used. At the end of 2001 the power supply cables of 10/20 kV are 57 of total length of 158.320 m.
In the early years of tram and trolley transport the cable networks have been supplied by means of oil cables. As of 1961 the total length of the cable network was 105.000 m; the total length of the overhead power supply lines was 15.000 m exceeding. In 1975 the total length was increased to over 450.000 m.
During 1981 a new type of dry cable with copper string was introduced. At that time a gradual replacement of the oil cables began; by 1990 almost all cables have been replaced. Their total length was 525,650 m.
During 1995 a dry cable with plastic protection, aluminum string and cross-section of 500 mm2 has been developed. This type of cable replaced entirely the more expensive (over three times) copper string cable. As of 2001 the total length of the cable network was increased to 643,800 m., and the number of the cables became 667. As of 2006 the total length of the cable network was increased to 740,000 m.
Initially, the railway maintenance was carried out by a specially established group and a section producing spare parts in an specialized workshop. In 1965 the three sections, namely Thermit-Switch section, Catenary-Cables Network section and Converting substations sections merged in a division under the name Railways, Networks, and Converting substantions. In 1975 that division merged in the company Electrotransport, and became its section under the name "Railways section". In 1987 that section dissociated and became a subsidiary joint-stock company of the SKGT Holding EAD. At the start of the tram transport, when the tram transport started, the total length of the railways was 23.377 the railway was track with special places for meetings, and without turns. The rails in use are of the Phoenix type (with a groove), connected by means of joints. The curves are accomplished by means of dual Vignol type rails, and the inner rail serves as a counter-rail. The railways are with a track gauge of 1000 (1009) mm. The very first switches were imported from the so-called Belgium Association; later on the switches had been imported from Great Britain, Austria, Czechoslovakia and Germany. In 1936 the first "assembled" switching point was completed in the Switch Workshop; the assembled switches were copied after the Czechoslovakian ones; the details used were made in the Switch Workshop of the company. Up to 1970 the railways have been laid predominantly on pavement. After 1970 several techniques were used: concrete tram railways, tram panel with length of 12.5 m etc. In 1982 tram railways consisting of 6 meter panels were implemented with the help of Hungarian specialists. There are 50 km of railways built, using this technology. In 1983 a new automatic mechanism for tram switches was developed. This unit was awarded a gold medal at the Plovdiv International Fair. In the same year, tests of the first installed switches heaters were accomplished. New machines have been purchased since 1980 until 1985 as follows: the unique so far (for this country) sleepers tamping machine, rails bending machine, “Geismar” groove-cleaning machine, milling machine, automatic screwdrivers, rail boring machines and rail cutting machines. In 1987 was initiated the construction of the standard railways with 1435 mm. track gauge. From 1980 up to 2000 the development of the tram switches technology was going on; a new type of spring blades was tested. The experiments were carried out jointly with specialists from Prashka Stoyarna - the Czech republic. The total length of the railways of 1009 mm track gauge at the end of 2001 year amounted to 169,000 m, and 39,000 m railways of 1435 mm track gauge. The total number of the railway switches at present is as follows: 231 in operation and 292 at the depots. The total length of the railways of 1009 mm track gauge at the end of 2006 year amounted to 169,000 m, and 40,000 m railways of 1435 mm track gauge.